Ever since the Tate Modern opened in 2000, the surrounding Bankside area has transformed from a derelict backwater into a dynamic arts-led neighbourhood with a plethora of creative studios and offices following in its wake. 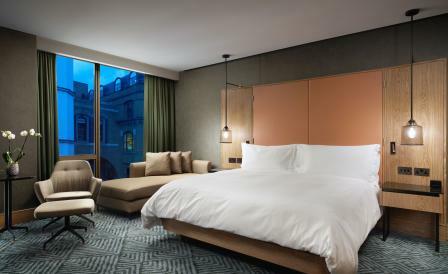 The flurry of activity didn’t escape the Hilton hotel group’s attention, which has opened its newest 292-room luxury property a short stroll from the River Thames and Shakespeare’s Globe Theatre. While the penthouse apartment with its private roof terrace and entertainment area will grab the headlines, we’re equally appreciative of the finely balanced design, a collaboration between local firms Dexter Moren architects (responsible for London’s Shangri-La hotel) and Twenty2Degrees. Exposed metal screens, bare brick work and reprocessed tube station tiles nod to the area’s industrial past, while custom murals and artworks bring the hotel up to date with the current mood. A relaxed brasserie offers all-day dining, and the bar (located on the site of a former 19th century essence factory) pays homage to its heritage with homemade aromatics and infusions adding a touch of authenticity to its signature cocktails and enormous selection of gins.